Our Spring and Fall clean-up service includes the use of high powered vacuum equipment to remove all debris from your lawn –without mulching it into the turf; and de-thatch raking is standard in the Spring. HIGH PROFILE mowing crews begin by collecting litter and controlling weeds in your landscape areas. Then, they mow your lawn to achieve the best appearance and healthiest turf possible throughout the entire season. Our “checkerboard” cutting technique is sure to create a showcase of your most prominent turf areas. In lawn maintenance the lawn will be mowed to a height of 2 ½ – 3 ½ Inches as conditions such as weather and terrain warrant. All buildings, landscape areas, trees, and other obstacles on turf area shall be trimmed around using power line-trimmers, and without causing damage. Sidewalks and curb lines shall be trimmed of overgrowth and a clean, crisp edge maintained. All pavement, sidewalks, patios, and landscape areas will be blown clear of grass clippings and debris. Clippings on the lawn shall be dispersed, or collected and removed so that at no time will there be “clumps” visible on the lawn. There may be a minimal per-cubic-yard disposal fee applied when excessive growth requires the collection of grass clippings. Weekly Services are defined as regular visits every 6-12 days, weather permitting, for the primary purpose of maintaining the lawn according to the height specifications listed above. In cases of drought or extreme heat, HIGH PROFILE may “spot-cut” in order to maintain a groomed appearance without causing damage to heat-stressed, or excessively wet turf areas. Damage caused by line-trimmers. Proper landscaping design dictates that any building, or obstacle with a surface not suitable to withstand incidental contact by line trimmers should have some form of landscape buffer, or protective agent, between it and turf areas. For this reason, HIGH PROFILE will not line-trim within three Inches of unprotected obstacles and building exteriors to avoid damage. We shall reserve the right to chemically control these areas, or we will offer to install and maintain proper mulch beds at a minimal cost if none exist. Since 1994, we’ve been mowing in our signature checkerboard pattern which enhances contour and appearance. Pattern cutting has since caught on, and although many other companies and even homeowners are now doing it, few can match the contrast and sharpness that we’ve achieved over years of practice. Weed Control of non-turf landscape areas shall be performed either manually, or chemically as needed. Annual Flower beds not included. Aging landscapes without weed barriers may require extra attention at T&M rates. HIGH PROFILE offers complete landscape services. Tree “volunteers”, or new growths at the base of and on the trunks of deciduous trees, will be regularly removed up to the first branch or 6 Ft. Grounds will be policed for debris*, both natural and foreign. Lawn and Landscape areas will be monitored for possible problems such as, improper irrigation, disease, damage, weeds, insect infestation, and varmint/animal control issues. Debris is defined as small sticks and general litter. Debris does not include cigarette butts, or larger items such as car batteries, tires, furniture, large branches, etc. Excessive debris such as the result of high winds/thunderstorms or lack of on-site custodianship may be removed and appropriate labor/disposal fees billed. We will attempt to contact the Owner, Agent, or their Authorized Designee prior to a significant billable occurrence, but shall proceed to the extent that HIGH PROFILE can perform our regular contracted services. At HIGH PROFILE we mow lawns in accordance with our turf height specifications, appearance standards, and with the health of the plant in mind –not solely based on specific calendar dates. If the season starts early, or runs long, we’ll mow as needed at no additional charge! Watch out for contracts that have “hard” beginning and ending dates for mowing. This is where you’ll see those extra billable charges for so-called “pre and post-season” mowing. You’ll notice that our mowing crews regularly invert their line-trimmers when trimming side- walks and drives. A vertical trim contributes to a neat, crisp appearance that looks as if it was just edged mechanically. The extra time we spend on the details is what sets us apart. The customer that recognizes the difference is a HIGH PROFILE customer. Spring Clean-up shall be completed by May 15th, weather permitting. Complete Fall Clean-up shall be performed between October 7th and October 31st, weather permitting. Client understands that leaves which accumulate after the fall clean-up will be removed during the subsequent spring clean-up. Additional fall clean-up services shall be made available upon request at an additional cost, and weather permitting. All debris, both natural and foreign, removed from turf areas. Landscape areas and shrubbery cleaned and blown free of all debris. 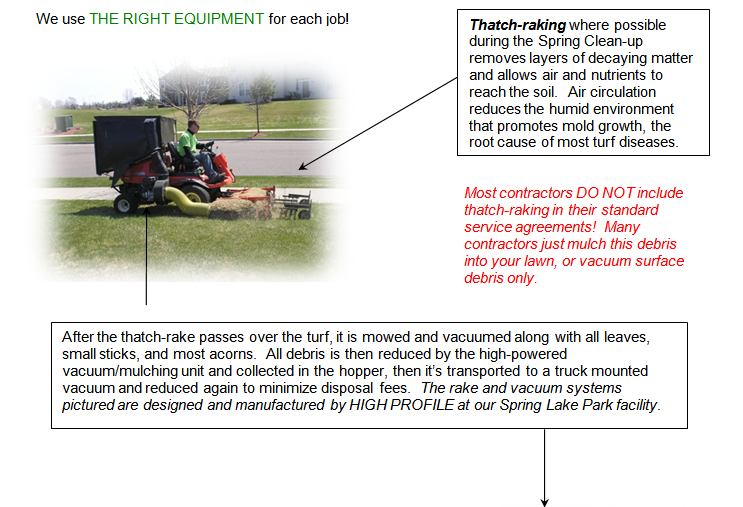 Thatch Rake (spring only) and vacuuming of turf (spring & fall). All debris removed from property and properly disposed of. A disposal fee at the current industry rate of $10.00 per cubic yard is applied to off-set fees incurred at municipal compost-sites. Kim, Rob, Jake, Josh, Eric, Barb Tim. © 2012 High Profile Grounds Maintenance, Inc.